South Korea is ready and willing to resume its economic cooperation with North Korea if the move will help accelerate denuclearization of the communist state, South Korean President Moon Jae-in said Tuesday in his telephone conversation with U.S. President Donald Trump. The offer came as Trump is set to hold his second meeting with North Korean leader Kim Jong-un next week. "President Moon Jae-in also told (President Trump) to have South Korea play a role in providing corresponding measures to encourage North Korea's denuclearization steps," Moon's spokesman Kim Eui-kyeom said in a press release. Trump and Kim first met in Singapore in June, and the North Korean leader agreed to fully denuclearize his country in exchange for security guarantees from the U.S.
Pyongyang's denuclearization steps, however, have largely stalled amid its demand for "corresponding measures" for measures it claims to have taken already. The U.S. has been widely expected to make some concessions at the second Trump-Kim summit and offer some incentives to the impoverished North. "President Moon said the country is ready to play that role by reconnecting inter-Korean railways and roads and launching inter-Korean economic cooperation projects if asked by President Trump and said it was a way to lessen the United States' burden," the spokesman added. The second Trump-Kim summit is set to be held in Hanoi on Feb. 27-28. "President Trump explained preparations for the Hanoi summit and negotiations between the U.S. and North Korea, and the two leaders held frank discussions on specific ways to cooperate for the success of the second North Korea-U.S. summit," the spokesman said of the Moon-Trump conversation. 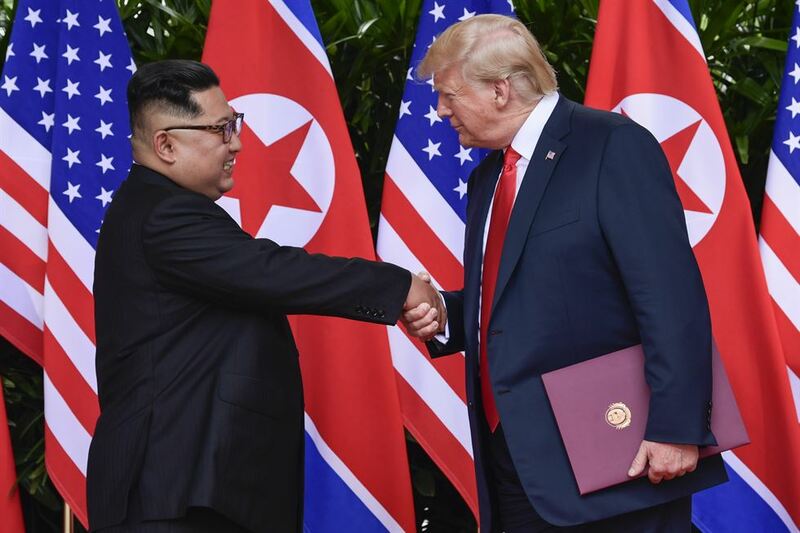 "President Trump expressed high expectations for the Hanoi summit and said he will continue to closely discuss with President Moon about the outcome of the summit and follow-up measures," he added. To this end, Trump offered to call President Moon as soon as his Hanoi meeting is over to explain the outcome of the meeting. "President Trump also said he expected to make great progress at the Hanoi meeting and expressed hope to personally meet with President Moon Jae-in because he has to share the outcome of the meeting," the spokesman said. Moon praised his U.S. counterpart for his efforts to denuclearize North Korea, noting that Trump's leadership has made possible what all others have failed to accomplish before. "I express my respect to President Trump, who has overcome the diplomatic failure that achieved no progress through negotiations over the past 25 years and rather enhanced North Korea's nuclear and missile capabilities, and who is currently seeking diplomatic strategies for denuclearization of the Korean Peninsula and establishment of permanent peace," the South Korean president was quoted as telling Trump.